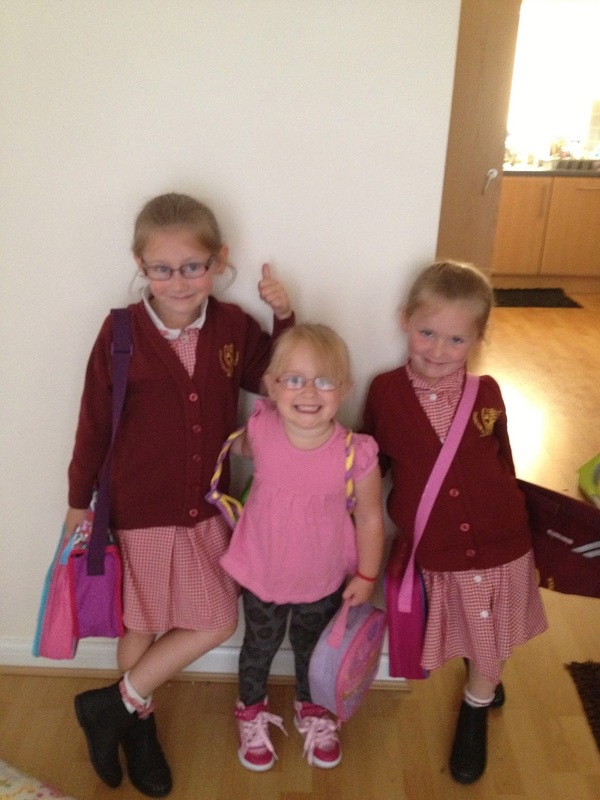 Today was the day, back to school time has arrived!!! I dread this day every year for many reasons, the biggest one being getting myself and the kids back into a routine so that we can make it out of the door on time. The horrible sound of an alarm ringing signalled go time at 7am. Unfortunately for me, I've been up since 6am with Layla, not sure what way is better to be woken up really. I was greeted by a surround sound of groans from three children as I told them it was now time to get up and have breakfast. However once they were up and in the land of the living things started running smoothly, phew!! By 8am we had two girls all fed, washed and dressed, all ready for the new school year. I have to admit feeling quite proud of myself that I'd managed to get everyone sorted without rushing around. That was until 8.20am rolled round and Elise kindly reminded me that I hadn't made their lunches, ooopppps. 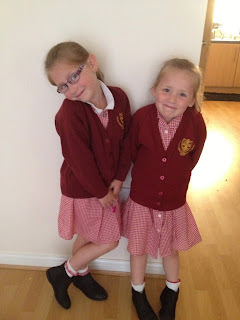 So that's day one of back to school complete and I would call it mission success, although I am already missing my girls, it is far too quiet without them around!! How has everyone else coped with going back to school, have you all made it to the school gates on time?? you could always home educate!! Mine started at High school and I was so upset as I feel like he is turning into a big boy and I am loosing my innocent little one. I am so glad it is Friday, no packed lunches to make, no early to bed although by Sunday it is time to start again, I love the School Holidays! The pictures of your girls in the uniform are really lovely. I am also celebrating the fact that it is now Friday, not looking to the 5 day week next week!!! Sounds like a great start to the school year! Kudos for getting out the door on time! Always a challenge at my house! Visiting from Friendly Friday! Hello from the Friendly Friday link-up! I am a teacher (although not currently teaching as I am about to move to the U.S) so sympathise greatly with not liking the alarm! ooo good luck with your move!! I am with you on the lunch thing. I consider it a holiday when lunches are available at school on special occasions. Bliss not having to deal with sandwich fixings and bland carrot sticks! ;) Visiting via 'Friendly Friday' blog hop. early mornings are the worst!! We were rushed the other morning and loaded into the car, leaving my youngest child's Show & Tell item on the dining room table. Of course we had to go back and get it, and we barely made the bell (so he wasn't tardy). Visiting today from Love My Post!